Mushrooms 101: Select, Serve and Savor. Mushrooms are one of my favorite foods to cook and eat. 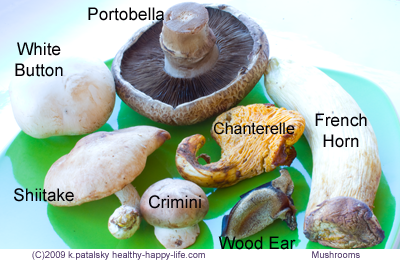 Mushrooms are incredibly diverse in shape, size, texture, taste, smell, and even price. 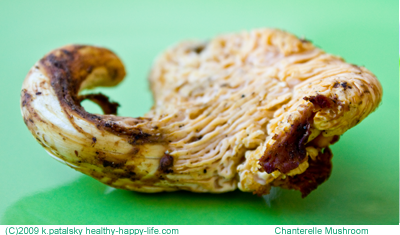 From the simple white button to the exotic chanterelle, mushrooms provide a chef a wide variety of options to get creative. In the foodie world of Michelin stars and celebrity chefs who sometimes laugh at "sauce on the siders and vegans" (ahem, my favorite-Tony Bourdain) - mushrooms get respect. I have three most memorable mushroom moments at restaurants....which I'll describe later in this post. So click forward to get the 101 on a few mushroom varieties, mushroom photos and my top three 'mushroom moments'. I'll admit it. I used to hate, despise and loathe mushrooms. Those floppy flavorless flakes on pizza? Those chewy bits of sauced gray 'ears' sitting on my dinner plate? No thanks. 3. La Tasca in Virginia. This was when I was first starting to embrace my mushroom cravings. At this Spanish Tapas restaurant in Clarendon Virginia, I'd order the side of Champiñones al Ajillo, Mushrooms sauteed lightly in garlic and olive oil. They are whole, halved and quartered-thick cut shrooms served in a sizzling hot clay pot. Side of sangria, vegetarian paella, spicy potatoes and Pan a la Catalana and I am in tapas heaven. 1.And my number one mushroom moment was when I had my "wow I really love mushrooms" epiphany. I was in Paris France for the first time and dining at Cafe De L'Homme, which has a stunning view of La Tour Eiffel. And with a limited menu for a vegan, I ordered all the veggie side dishes. I tasted the mushrooms-small marinated morsels of deliciousness, and I was hooked. Only in Paris would I try mushrooms and love them-back then anyways. Mushrooms, aka funghi, are incredibly diverse. 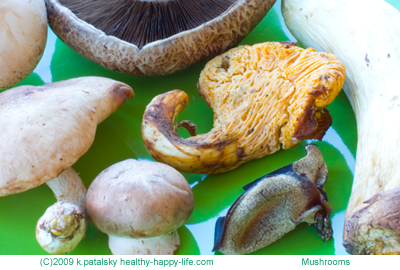 There are over 38,000 varieties of mushrooms. But only around 700 varieties are edible. Look: White stem and cap. Not squishy. Firm to touch. Creamy white on the inside. Thick stubby stem. Taste: Very mellow in flavor. Soaks up flavors very well. Prep: Wash well, remove any dirt bits. Serving Suggestion: Best for soaking up flavors rather than providing any of its own. I love white button shrooms sliced very thin and added to garden salads. You can also marinate the slices in some citrus juice and salt (lemon, orange, lime or even grapefruit.) Delicious on pizza-the traditional pizza mushroom. Great for absorbing liquid in salads or raw dishes that you don't want to get soggy. Least expensive mushroom. Look: Immature portabella shrooms. Dark cap, white stem. Creamy white on the inside. Smooth to touch. Taste: Bolder, earthier in flavor than a white button, but similar consistency and vein of flavor. Prep: Wash, clean off any dirt, dry. Serving Suggestion: Serve thin and raw in salads, slice thickly to be sauteed or marinated. Goes well with light marinades like light vinegars or lemon to counteract its earthiness. Look: Vase-shaped. Ranges in color from bright yellow to deep burnt orange to pale cream. Deep veins and pores on body. Stem merges softly into cap. No distinction sometimes. Cauliflowerish texture. Taste: Delicate and nutty flavor. Less earthy or woody than other mushrooms. Taste is complex and can be enjoyed in its pure state. Prep: Clean well, remove grit, dry. Serving Suggestion: Can be enjoyed in its own marinade of light salt, mushroom juices and a tad of sauteing oil. When adding them to a recipe-add late to avoid overcooking the mushroom-can easily become tough and rubbery. Divine complex texture is highly respected by the most discerning of chefs. Expensive shroom. Look: Matured version of baby bellas, criminis. Largest and heaviest of commercial mushrooms. Wide dark cap. Soft squishy and textured. Prominent ripples under the cap. Taste: Long growth cycle gives it a deep, meaty, savory flavor. Very earthy and woody. Prep: Wash well, remove stem for grilling and in most prep situations. Serving Suggestion: Often the vegetarian substitute for 'burgers' on a BBQ grill day. Easy to slice thickly and marinate. Too meaty and bold to eat raw-in my opinion. Adds savory flavor to soups and stir-frys. Look: Light golden brown. Outer layer looks like suede. Broad umbrella shaped cap, long spongy stem. Can be 1/2 inch to ten inches in diameter. 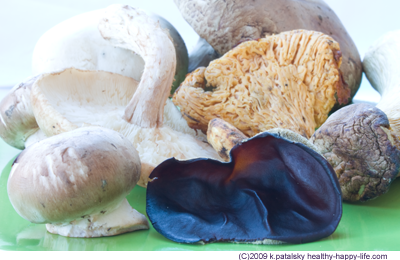 Taste: Meaty texture when cooked, yet milder in 'earthiness' than a portabella. Adds a woody quality to a recipe. Prep: Clean well-scrub and grit off cap. Dr. Slice or whole cook. Serving Suggestion: Delicious in soups and stir-frys. You can cook them whole or slice them thinly. Very easy to marinate when thinly sliced. My favorite method is to saute them in light olive oil, lemon juice salt and garlic. Then I toss the cooked shrooms in a lot of fresh black pepper. Look: Floppy, no stem, like leather. Silky, shiny brownish purple on one side. Fuzzy gray on the other. Flat or ear-shaped. No cap. Grows directly on a tree log in a flat, or curled ear shape. Taste: Generally flavorless. Used more for their unique color and texture. Prep: Wash lightly, dry. Slice or add whole. Serving Suggestion: Usually found in sweet and sour soup. Adds interesting color and texture to soup dishes. Be careful to not slice too thinly, as this mushroom has no real shape or body to hold and could become slimy and too thin for some palates. Look: Long wide stem with a small thin cap. Pale in color. Cap in grayish-brown. Smooth like a white button. Squishy and light like a shiitake. Taste: Mellow, similar to the white button mushroom, except has an elegant fresh straw or mowed hay aroma. Chewy and rubbery if undercooked. Prep: Easy to wash gently. Little grit. Dry. Serving Suggestion. Cut long into thin strips and saute or add to soups and stir-frys. Goes well with bold entree dishes since it absorbs flavor and adds very mellow undertones to a dish.